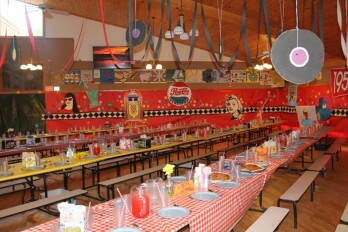 Through a partnership with Express Food Service (EFS), Camp Interlaken JCC always provides kosher, nutritious and well-balanced meals. The Interlaken team partners with EFS’s team and EFS’s nutritionist to create Camp’s summer menus. EFS’s team of chefs spend their summers living on site at Camp Interlaken. Click here to read more about Express Food Service. Our Kosher kitchens consist of a separate meat kitchen, dairy kitchen and a pareve bakery. Each item that we serve at camp must have an appropriately recognized kosher hechsher (symbol or special marking found on the packages of products that have been certified as kosher). 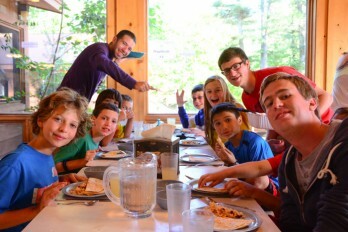 At camp we eat three meals a day family style to promote conversation and community within the cabin groups. Occasionally, we may have a buffet meal if that fits in with the camp program. We serve most meals in the Chadar Ochel, our dining room. 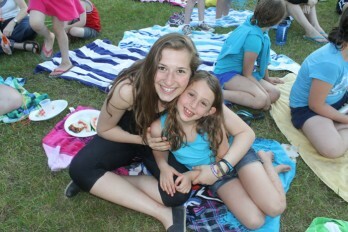 We eat lakeside on our lawn for a picnic lunch while the dining hall is being prepared for Shabbat on Friday afternoon. On Wednesday nights, we have cookouts throughout all of camp where campers enjoy freshly barbequed hamburgers and hot dogs. 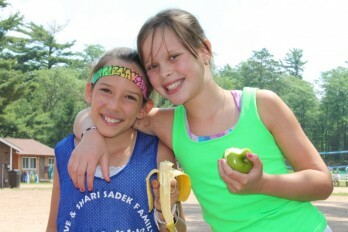 Healthy choices are available for all appetites, from our youngest campers to our adult staff. We have fresh fruit available all day in the chadar ochel, a salad bar, vegetarian, vegan, and gluten free alternatives. Special diets are monitored by our Food Service Manager, who takes care of these personal needs. We are extremely diligent and supportive when it comes to caring for campers with special dietary needs, particularly those with food allergies, sensitivities, and/or intolerances. Importantly, we maintain a Peanut/Nut Free policy throughout our whole camp. Soy is the most common peanut substitute, and we do serve soy nut or sun butter at lunch and dinner as a protein alternative. No peanut or tree nut products are permitted to be brought into camp or provided during the summer. Other food allergies and food related health issues are readily dealt with on an individual case basis including gluten sensitivity and lactose intolerance. Camp Interlaken regularly stocks rice milk, soy milk and will stock lactaid milk as needed. Lactaid tablets can also be given at meals and snack time. Campers that are gluten free can expect meals that mirror the camp menu while their meals may also be supplemented with Udi’s or a similar brand’s items. Gluten free bread, pasta, pancake mix, and prepackaged treats are stocked in our kitchen. The food service manager assures that there will not be any cross contamination. In addition to the more serious food sensitivity diets, we also support special needs like vegetarian or vegan campers. While “picky” eaters present challenges for most food service operations with a somewhat fixed menu, we do provide alternatives at each meal and address specific camper needs at the beginning of the summer. A full salad bar is available at lunch at dinner which includes a variety of vegetables, tuna, fruit, pasta salad, etc. Soy Nut Butter is available at lunch and dinner as well as homemade soup. Campers are encouraged to let their counselor know if they cannot find anything sufficient to eat at a meal, and the counselors will help connect them with the Food Service Manager to find an alternative. We ask that parents do not send any food to camp. Please contact the camp office prior to camp if you have additional concerns or want to share any additional information with us.